No one wants to cancel a vacation, but sometimes life interrupts the best laid plans. It's good peace of mind to have insurance in case you do need to cancel. We highly recommend it. Q: When will I receive my confirmation and what should I do once it arrives? As soon as we have processed your trip deposit, your confirmation packet will be sent. You should sign and complete the Visitor's Acknowledgement of Risk and Information Sheet and return them to us immediately. Your confirmation packet will also contain a packing list and clothing catalog, general questions and answers, helpful travel information, and cancellation insurance order form. If you booked through a travel agent, your confirmation will be sent to them for forwarding on to you. ​Q: When will I receive my confirmation and what should I do once it arrives? Q: When do I need to pay my balance? Payment in full is due 90 days prior to trip departure and may be paid by check (preferably) or credit card. For your convenience, we will charge the balance due to your credit card 90 days prior to trip departure (if full payment has not been received). We reserve the right to cancel your reservation if full payment is not collected by the due date. Q: What if I must cancel my trip reservation? If you must cancel any reservation, the information and reasons regarding the cancellation must be received in writing. The cancellation fee will follow the formula in the box below. Our cancellation policy applies in every instance and there will be no exceptions for any reason. 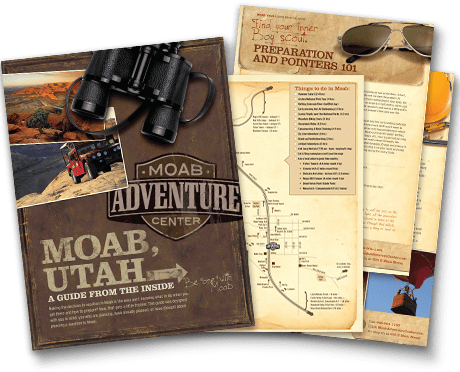 Moab Adventure Center will not issue any refund for arriving late or leaving a trip early. Western is not responsible for any expenses incurred due to travel delays, flight cancellations, or illness. If you are concerned about the possibility of having to cancel, we strongly suggest you purchase trip cancellation insurance to protect your vacation investment. Some of the most difficult situations we have had to deal with concern making a "win/win" out of a situation when a guest needs to cancel a few days before a trip because they broke their leg, an elderly parent suddenly gets sick, or some other catastrophic event requires cancellation. In these situations, we generally do not have time to refill the space. Yet, we have already spent considerable time, money, and energy preparing for your trip: scheduling vehicles, flights, drivers, guides and equipment, purchasing food, etc. Because of our short season and very limited number of available seats, we cannot afford the financial loss that cancellations cause. Therefore, in deciding whether or not to buy this insurance, consider the investment you are making in your vacation and whether or not you could afford the loss if you did have to cancel. For only $7.00 per $100 of coverage, this insurance provides reimbursement of all applicable tour costs associated with your cancellation according to policy details. Please see policy order form for coverage details. You can also purchase more comprehensive coverage to insure travel delays, baggage loss and other travel-related issues. A policy order form will be enclosed with your confirmation packet. You may also print this insurance order form or order cancellation insurance online. Again, we highly recommend you purchase insurance to protect your investment as our cancellation policy will apply in every instance. Western River Expeditions assumes no financial responsibility for personal injury, emergency evacuation, or equipment lost or damaged in any way. Trip and date transfers 60+ days prior to trip departure and within the current year will incur a $50 per reservation service charge. Trip and date transfers 60+ days prior to departure that are transferred into the following year will incur a $100 per person service charge. Once a trip has been transferred, no refunds will be issued. Transfer dates, reasons and information is required in writing. No refunds or transfers will be allowed within 0 to 60 days of trip departure for any reason. If you live outside the United States, you can use this resource to find and purchase insurance for your trip.